Great news Stella & Dot fans!! The Summer Sale launched today! Now through Tuesday, May 30th, you can get up to 50% OFF select styles. This is the perfect opportunity to earn Dot Dollars on top of saving big on your favorite Stella & Dot products! Details for both promotions are below! 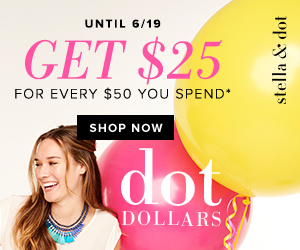 Deal: Spend $50 and get $25 in Dot Dollars! What will you be buying from the Stella & Dot Summer Sale? How amazing! 😍😍😍 I wish there was these types of brands in the country where I come from. Of course, sales like these too!! !